Please visit our website to learn about our youth programs including Green Team, Summer Stewards, and schoolyard gardening! With the recently completed Manchester Street Park and Cronin Park Gardens, the city has doubled the number of garden plots and we now have community garden space available for the first time in a long time! 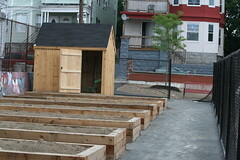 If you are interested in your own space to garden at Manchester Street Park or Cronin Park contact Rose. 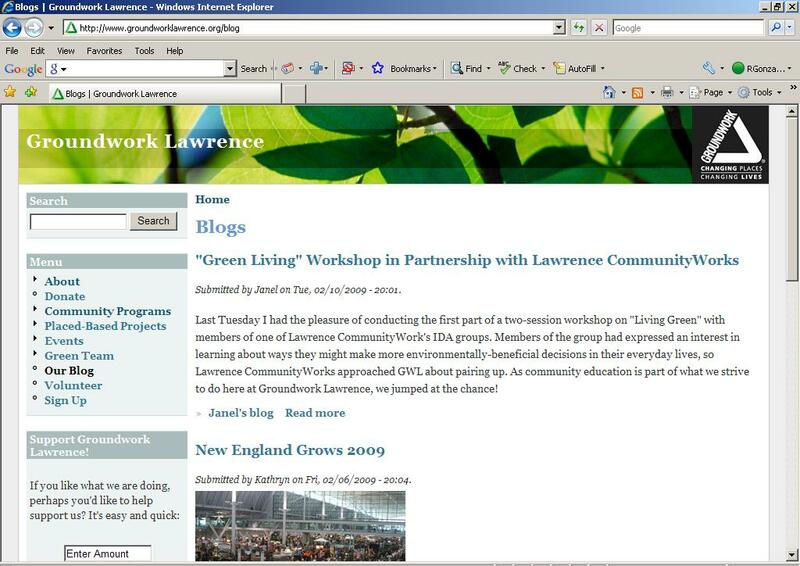 Each year Groundwork Lawrence helps Lawrence residents, businesses and organizations to "change places and change lives" with new and improved parks, gardening, wellness and youth programs, clean-ups, tree plantings and family festivals. Any amount you donate helps us continue these much needed programs and projects. It was a busy and wonderful summer. 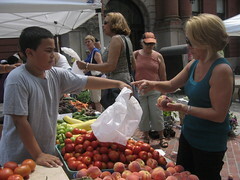 With the support of 7 summer interns we were able to expand the farmers market to include Tuesday evenings and Saturdays, pilot the Summer Stewards youth program, maintain the Tarbox's new schoolyard gardens at Cronin Park, and complete a sample street tree survey to help the Urban Forestry Coalition plan for increasing the city's tree canopy. The end of the summer was bittersweet as we said goodbye to Kathryn and Janel and wished them luck as they headed to new states and back to school. The sweetness came as we welcomed new staff members Brad Bruschur, Project Manager, and Annie Rickards, Program Manager, as well as Maria Natera, LISC AmeriCorps member, and Chuck Melchin, UMass Lowell Arts, Regional Economic and Social Development Fellow. In addition, I hope you'll all help me in congratulating Rose for her promotion to Deputy Director! As the school year starts we are looking forward to this weekend's Spicket River Greenway Cleanup, planting the City's first Community Fruit Orchard on September 23, and our Annual Glow Gala and Fundraiser on November 18. 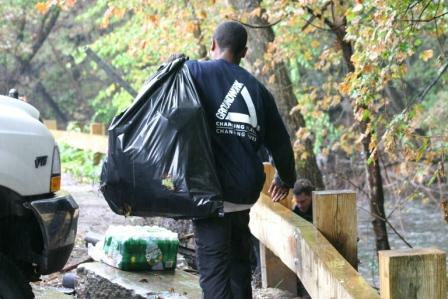 The 9th Annual Spicket River Greenway Cleanup is this Saturday from 9:00 - 1:00. Registration starts at 8:30 AM at the corner of Union and Canal Streets at the Everett Mill and we'll finish the day with a free BBQ for all volunteers. Thank you to our sponsors: Enel, N.A., Lawrence General Hospital, Allied Waste, Covanta Energy, and Mainstream Global. Learn more and download a registration form. Groundwork Lawrence and the City of Lawrence have been awarded $2.6M from the Commonwealth of Massachusetts for its Spicket River Revitalization Project. The funds allow for the realization of a decade-long effort to build the Spicket River Greenway, which will link the new and existing parks along the River through the lowest-income areas of Lawrence. To learn more about this exciting news read our press release(pdf), as well as the Commonwealth's release(pdf). Thanks for all the voting at Communities Take Root. 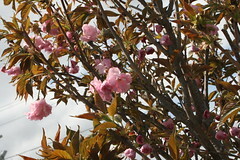 The planting will take place on September 23rd and we are looking for volunteers. We are finalizing details and we'll keep you informed over the next couple of weeks through the website, blog, and Facebook page. 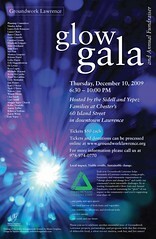 The Glow Gala is quickly approaching! Join us on November 18 at Chester's, 60 Island Street, Lawrence. Stay tuned for the Eco-Art Call to Artists and more details. 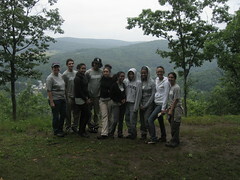 Check-out photos from previous years on our Flickr site. The Cronin Park ribbon cutting was held on June 17th! Learn more about the park and check-out photos on our Flickr site.